With a first drying speed, the machine only needs more than ten seconds and less than twenty seconds. It has the instant drying feature. During the drying, the temperature of the liquid drops is relatively low. This is particularly suitable for drying the heat sensitive materials so as to keep the color, smell and taste for the materials. In order to prevent that things, like sticking to the wall, appear in the drying tower, the device is equipped with a special structure that can effectively avoid the thing of sticking to the wall. The specialwind supply system for the final products will separate the dried products with the hot and wet air in the system in time to avoid the possibility that the dried final products may absorb the moisture and form the blosk. Spray drier for Chinese traditional medicine (drying equipment/drying machine) is suitable for drying the Chinese traditional medicine products that are low in fusion point and high in the sugar contents. 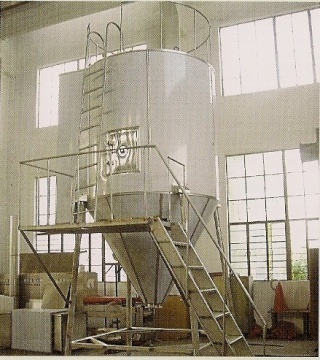 And the machine owns the characteristics that its products do not sticky to the walls and that they are uneasy to absorb the moisture and etc.The technological conditions for the spray and drying are decided according to the features and property of the products to be dried for the machine. The machine is high in automation is easy in operation. It meets the GMP requirements. The calculation and selection of the technological parameters are totally completed through computers. The successful development of this machine has settled the technical difficult point for which it is very difficult to use the spray and drying technology for Chinese traditional medicine products with low fusion point and high sugar contents for many years. This machine is also a new development for the application technology research of the spray and drying in Chinese traditional medicine industry. Heated by a heater, the air enters into the hot air distributor on the top section of the drying tower. After passing through hot air distributor, the hot air enters into the drying tower uniformly and moves in the spiral state. 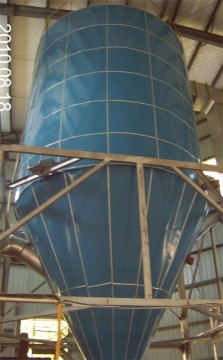 At the same time, the material pump sends the material liquid to the centrifugal spray on the top of the drying tower. The material liquid is sprayed into very fine mist-state drops. The surface area that the material liquid contacts the hot air is increased greatly. The water is evaporated fast. In a very short time, the products are dried into the dried final products. The dried final products are separated with the et air by the whirl separator. The dried final products will pass through the material collection whirl room at the bottom of the whirl separator and are sent to the small whirl separator for separation by the dried air. The final products will be collected in the material collection barrel. The exhausted gas will be discharged through induced draft fan. All the hot air system, blowingsystem and air sending system of the drier have the first effect, middle effect and sub-high effect filters and other filters. All the air entering the drying system has passed the filtering treatment. All the sections of contacting the materials use the stainless steel and meet GMP requirements.